It’ll be on Instagram, Facebook, and Twitter. The opening shot of the revolution was just fired. And most of us pretended the sound was business as usual. A few years ago, way way back in 2008, Dave Carroll had his guitar broken by United Airlines. When the air carrier wouldn’t do anything about it, Carroll wrote a song and recorded a video titled, “United Breaks Guitars.” After tens of millions of views, Time Magazine called Carroll’s video one of the top 20 viral videos of all time. Today Carroll is a successful professional speaker who specializes in customer service. Carroll’s video was simply the warning shot of the skirmish that lead to the revolution. It should have been a warning shot fired across the bow of corporate public relations and traditional media. If it had, traditional media personality and Fox News anchor, Laura Ingraham, would have gotten the message and changed her tune. Otherwise, how can you explain Ingraham using her bully pulpit to go after Parkland teenager David Hogg? More importantly, how can you explain her not knowing what would go down now that the revolution has begun? In response, the 17-year old reached out to his 700,000 Twitter followers. Hogg identified Ingraham’s sponsors for supporting a bully. He then asked his followers to complain to Ingraham’s sponsors AND to ask their followers to do the same. In just a few days, more than a dozen of Ingraham’s advertisers pulled their advertising from her show. These cautious advertisers included Atlantis Bahamas, Expedia, Hulu, Jenny Craig, Johnson & Johnson, Jos. A. Bank, Jenny Craig, Miracle-Ear, Nestlé, Ruby Tuesday and more. Needless to say, this story will continue to develop. But the bigger story is the sea change this story represents. Because it shows all of us that the tide has changed for once and for all. Traditional media no longer has exclusive control of outreach. Instead, YouTube, Instagram, and whatever social media platforms are still yet to come enable everyday individuals to have a powerful and profitable reach that will help us accomplish our goals. That opportunity is not just the exclusive power of David Hogg, it’s you and I too, folks. What Ingraham experienced — and what each and every one of us must learn as well — is that this is not simply a cultural revolution but an economic one. Because, as we’ve seen, the consequences of Ingraham’s imprudent words hit her right between the eyes and directly in the pocketbook. Considering the 700,000+ people on Twitter who helped David Hogg are called “Followers,” perhaps it’s time to redefine the term “Follow The Money.” Because the winners of today’s revolution will be the ones who can motivate their followers to make things happen. And that power is now available to all of us — not just those who traditionally controlled the media. 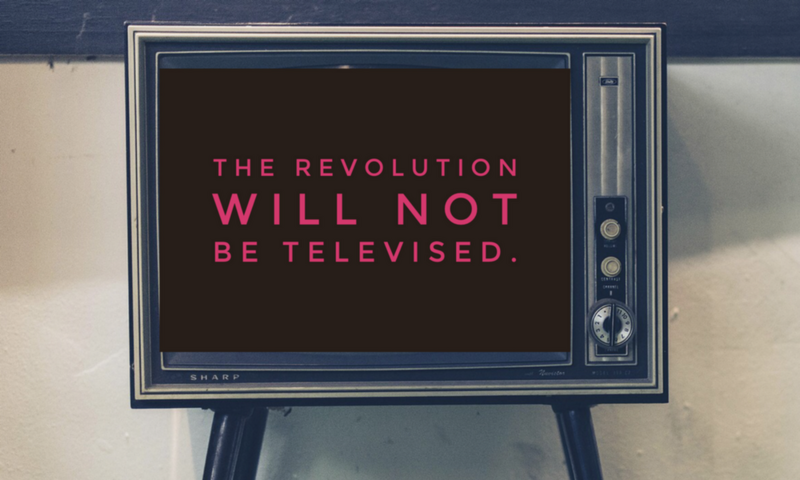 The revolution will not be televised. It will be fought — and won — on social media. Buckle up tight… it’s gonna be a bumpy ride.